Studio Line: MGM - His whole life was a million-to-one shot! Academy Awards: Won for Best Picture; Best Director; Best Film Editing. Nominated for Best Actor-Sylvester Stallone; Best Actress-Talia Shire; Best Supporting Actor-Burgess Meredith, Burt Young; Best Screenplay; Best Sound; Best Song-"Gonna Fly Now". 1977. DVD: Widescreen 1.85:1/16x9; audio English Dolby Digital 5.1, French Dolby Digital 5.1, Spanish Monaural; subtitles Spanish, French; closed-captioned; single sided - dual layered; 25 chapters; Rated PG; 119 min. ; $24.98; street date 4/24/01. 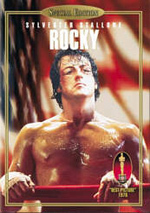 Supplements: Audio Commentary From Director John G. Avildsen, Actors Talia Shire, Burt Young and Carl Weathers, Producers Irwin Winkler and Robert Chartoff, and Steadicam Operator Garrett Brown; Video Commentary By Sylvester Stallone; 3 Rocky Featurettes: “Behind the Scenes With Director John G. Avildsen”, “A Tribute to Burgess Meredith”, and “A Tribute to James Crabe”; Theatrical Trailers; TV Spots; Collectible Booklet. Here's an age that has become increasingly hard to recall: the era in which Sylvester Stallone was a respected talent. I don't know which route is more common, but some actors follow one of two paths. On one hand, a few performers start out as popular but poorly-regarded among the critical community, and they later earn respect; Jim Carrey falls into that category. On the other hand, there’s the Stallone way; although Rocky was far from his first film, it was the one that brought him fame and success, as it earned an Oscar for Best Picture in addition to nominations for Stallone himself in the acting and writing categories. But it's all been downhill since then for old Sly, at least as far as critical acclaim goes. Through the Eighties, he became a huge star but got farther and farther from the sense of realism and honesty that pervaded his earlier work; he clearly believed the hype, especially after the enormous success of Rambo: First Blood Part II in 1985. After that hit, we experienced atrocities such as Stop! Or My Mom Will Shoot and the arm-wrestling epic Over the Top. Stallone attempted to regain some of his lost reputation with the more serious and gritty Copland in 1997, but it didn't work; everyone still seems to view him as a big, dopey galloot. Was Rocky an aberration, a one-shot deal that spent whatever creative abilities Stallone ever possessed and forever doomed him to be a hack, or did success simply corrupt Stallone and spoil what could have been a nice run of good work? I guess we'll never know, but at least we have the original Rocky to look at as a fine film. I'm not quite sure it deserved to win Best Picture against some tough competition in 1976; it topped All the President's Men, Bound for Glory, Network and Taxi Driver. When you combine the continued resonance of both Watergate and Vietnam with the jingoistic glory that surrounded the Bicentennial, it's not surprising that Rocky, the only "feel-good" picture in the bunch, would take home the prize. The fact that the film's success - Rocky also was the biggest money-maker for 1976 - paralleled the story's "underdog" theme certainly helped as well. Did Rocky deserve to beat some of the classics against which it competed? Probably not, but that shouldn't diminish the fact it's still a fine and entertaining film. Unfortunately, the combination of some dreadful sequels and Stallone's generally-poor reputation have diminished this movie's legacy, but if it's inspected on its own, Rocky offers a strong experience. Stallone himself offers a gently sweet and affecting performance as Rocky, a not-too-successful fighter who gets an improbable shot at the big-time. While I wasn't sure I completely bought Sly during Rocky's moments of rage, he made the character endearingly modest and simple without creating a moronic joke; Rocky retained his dignity and seemed surprisingly real. 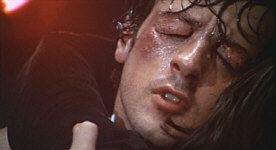 Also effective was Talia Shire's turn as Rocky's sweetheart Adrian. Oddly, I found her more believable as an intensely shy wallflower than when she grows as a person due to Rocky's affection. One unusual aspect of Rocky is that it actually makes some attractive people seem unappealing. Most movies take good-looking folks and try to make them look ugly, but it rarely works; it almost always appears obvious that underneath some bad style choices exists a hottie. That's not the case here; both Stallone and Shire look pretty grotty at times in their roles, and this sense of realism helps the film. Though the plot seems improbable, the film presents it believably and I easily bought into Rocky's story. The movie progresses at a nice pace which kept me involved and interested, though I thought it moved a little too quickly at times. For example, Adrian's transformation from skank to babe happened too quickly and effortlessly; one minute she's hiding in a corner, and the next she's all dolled up and ready to go! I also thought the climactic fight flew by too fast. We don't get enough of a feel for what an epic battle this thing was supposed to be; the montage treatment loses the sense of desperation and weariness it should portray. It's still a fairly rousing climax for the film, but I thought it could have been paced better. Speaking of the fight, I could never figure out one thing in regard to it: the match is billed as occurring on a big day for the US, and it seems likely this should be July 4. 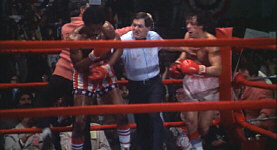 In fact, Apollo Creed (Carl Weathers) once refers to the bout as taking place on the nation's biggest birthday. 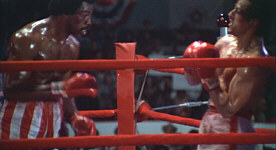 However, the fight actually happens on January 1, 1976. My guess is that they wanted to have it take place on July 4 but production issues caused them to change it to New Year’s Day. In any case, it seemed very confusing since every aspect of discussion about the bout clearly leads one to believe it'll take place on Independence Day. 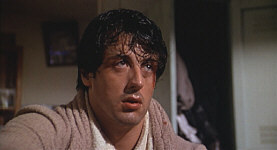 That oddity excepted, Rocky remains a very good film. The story of the underdog who makes good is as old as time itself, but it continues to maintain appeal and this movie shows how that can happen. I won't argue that Rocky deserved its Best Picture victory over some strong competitors, but I think it's a nice piece of work nonetheless. 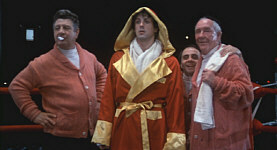 Rocky appears in both its original theatrical aspect ratio of approximately 1.85:1 on this single-sided, double-layered DVD; the letterboxed image has been enhanced for 16X9 televisions. The anamorphic-enhancement differentiates this transfer from the one found on the old DVD, but that’s almost literally the only way I could tell them apart. Otherwise, I found the two images to appear virtually identical. Still, the old picture looked fairly decent, and so does the new one. Although the film showed its age at times, it usually seemed pretty good and it provides a generally satisfactory picture. Sharpness almost always looked nicely crisp and precise; only a few isolated scenes displayed much evidence of softness. One improvement found on the new transfer: the modest moiré effects I’d seen previously now have disappeared, probably thanks to the increased resolution of the anamorphic image. Print flaws appeared at varying points throughout the film, but they seemed fairly minor for the most part. Light grain showed up at times, and some white speckles, scratches and also a little dirt marred the image on occasion, but most of the movie seemed pretty clean. I noticed an odd jitter in the background during a street scene at about 1:12:38; this problem occurred on the old transfer as well, so it appeared to be due to problems with the original source. Colors were generally subdued - this is a gritty character drama, after all, and Philly isn't Miami - but what I saw looked well-saturated and solidly accurate; Apollo's costume at the start of the fight came across especially nicely. Black levels appeared very deep and dark, and shadow detail also was appropriately thick without any signs of murkiness; both of those seemed especially important since so much of Rocky takes place in low-light situations. The picture on this DVD won't win any prizes, but for a low-budget drama from 1976, it looked pretty good. Also relatively strong was the film's Dolby Digital 5.1 soundtrack, audio that duplicates the sound heard on the old DVD. This remix of the original monaural audio expanded the image in a modest but pleasing manner. Most of the sound remained anchored to the center channel, but a few effects spread nicely to the sides as well. Probably the "showiest" instance happened early in the film when Rocky walked past some street singers and their voices panned from the center to the right. Other than that, it's just music - which boasted some very nice stereo separation - and ambiance on the sides. The surrounds also included these factors. The effects popped up from the rear mainly during the final fight scene, but the music drifted back there quite frequently, which added a lot to the impact of the score. Quality seemed decent but unexceptional. Dialogue appeared vaguely flat for the most part, but it remained consistently intelligible and clear. The one poor instance that involved speech occurred at about the 74 minute mark, when Rocky and Paulie talk in the meat locker; the dialogue sounded really rough and edgy during that scene. This wasn't an issue at other times, though. Effects were clean though thin, and the music sounded pleasantly crisp and distinct; the score largely lacked much low end but it seemed adequately reproduced. The 5.1 mix stayed appropriately modest and it worked nicely for the film. 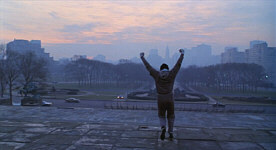 So far the new DVD of Rocky comes across as a virtual carbon copy of the original release. However, with its supplements, the special edition greatly outdoes the bare-bones old release, which included almost nothing extra. Here we get a nice mix of features, starting with a new audio commentary. This track includes director John G. Avildsen, actors Talia Shire, Burt Young - who also semi-hosts the program - and Carl Weathers, producers Irwin Winkler and Robert Chartoff, and steadicam operator - and inventor, actually - Garrett Brown. Oddly, Brown and Weathers aren’t credited on the DVD’s jacket as participants, but they’re definitely in there. All of the speakers were recorded separately and the results were edited together for this commentary. Through tracks such as this and the one found on another Best Picture winner, 1967’s In the Heat of the Night, MGM have quietly and consistently started to produce some of the best audio commentaries to be found on DVDs. They’ve taken a page from the Criterion book in their edited tracks. Some prefer the apparent spontaneity of running, screen-specific commentaries, but I almost always think that this kind of "compilation" provides the most effective discussions of a film, and Rocky supports my case. We learn a lot of great details about the movie, from its origins to the reactions it received with many stops in between. A slew of production notes appear, and we also hear some great anecdotes about the making of the film. Ultimately, I thought this was an entertaining and compelling look at Rocky. Some may bemoan the absence of Sylvester Stallone on the preceding track, but I don’t since we get a Video Commentary from him instead. Unlike programs found on DVDs such as Men In Black, this isn’t a piece that accompanies the film as a whole. Instead, it’s really just a 28-minute and 50-second interview with Stallone, and it’s a good one. He covers the genesis of the project and also goes through many aspects of its production, all while presenting the impact it had on his then-young self. Stallone can be a charming and interesting interview subject, and he proves that here. Just to clarify why I didn’t really care that Stallone didn’t appear in the audio commentary, think about what would have happened if he had been included with the others. Since the track featured such a large cast of participants, there’s no way we would have heard so many remarks from Stallone, and we also would have lost a fair amount of material from the others. Yes, a full commentary from Stallone on his own might have been nice, but then again, maybe he only had 28 minutes worth of statements to relate. In any case, I thought the combination of the audio commentary and the Stallone video interview functioned as solid sources of information. Next up are three Rocky Featurettes. 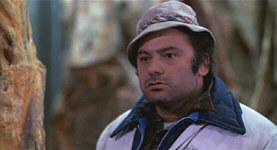 The first is a very intriguing look “Behind the Scene With Director John Avildsen”. In this 12-minute and 20-second piece, Avildsen discusses the fight rehearsal process and also shows a variety of 8mm test shots made to help refine the choreography between Stallone and Weathers. Also included are some glimpses of early make-up concepts; one of those would have allowed Stallone to easily fit in on the set of Frankenstein. Although Avildsen’s remarks repeat some of the material heard on the commentary - indeed, the latter seems to use the exact same tape - the 8mm test material is a terrific find and it offers a fun view of the filmmaking process. The other two featurettes pat homage to two now-deceased Rocky contributors. “A Tribute to Burgess Meredith” combines remembrances from Stallone, Young, Weathers, and Meredith’s friend, actress Lee Grant into a seven-minute and 45-second piece; all except for Stallone - whose statements come from his “Video Commentary” sessions - appear only as voice-overs while we see stills of Meredith. “A Tribute to James Crabe” lasts for three minutes and 30 seconds as director Avildsen talks about the film’s cinematographer. Both pieces are respectful and interesting, and I thought they added a classy touch to the DVD. A few DVD standards round out this package. We get trailers for all five Rocky films plus a prophetic “teaser”. While the latter’s comparisons of Stallone to actors like Jack Nicholson sound silly today, it did strike one truth when the narrator intoned, “His name is Sylvester Stallone, but you will always remember him as ‘Rocky’”. In addition, we find three TV spots for Rocky plus brief but decent production notes in the DVD’s “collectible” booklet. All told, it’s a pretty nice package, and Rocky continues to hold up well after a quarter of a century. The movie marks the creative high point of Sylvester Stallone’s career, and it offers a moving and inspirational look at a bum made good. The DVD provides generally mediocre but respectable picture and sound plus a complement of good extras. For anyone who doesn’t already own a DVD of Rocky, this new release definitely merits a look. However, if you possess the prior disc, the decision whether or not to “upgrade” is somewhat iffy. Though the special edition adds anamorphic enhancement to the transfer, it otherwise looked and sounded virtually identical to the original. The new supplements are all fairly good, so your interest in those should be the linchpin on which your decision makes. If you enjoy these kinds of extras, you’ll clearly want to pick up this copy. If you don’t care about them, however, you should just stick with the old one, especially if you don’t own a TV that can take advantage of the 16X9 transfer.